Shiraz Balolia has announced that Rick Jensen will take over the reins as Captain of the U.S. F-Class Open Team. Departing Captain Balolia deserves a great deal of praise for his hard work, dedication, and leadership of the team over recent seasons. Shiraz gave generously to the squad, in terms of both time and resources. Under his tutelage, the Open Team raised its standards of training and team-work. Shiraz will be a tough act to follow. Rick Jensen lives in Claremore, Oklahoma with his wife Crystal and his daughters Riley and Zoey. He started shooting local F-Class matches at Tulsa Red Castle Gun Club in 2005. Since then he has competed at the National and International levels. Rick’s first Nationals were in Lodi, Wisconsin in 2008. In 2010, Rick was a member of the winning North America Shooters team at the 4-man National Championship Team matches in Sacramento. Rick has shot at two World Championshipse — the 2009 F-Class World Championships at Bisley, England, and the 2013 FCWC at Raton, NM. 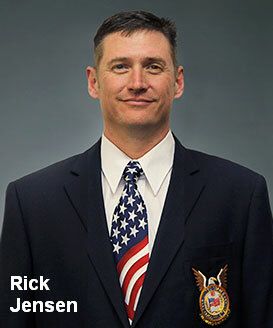 Rick considers one of the most memorable highlights of his career to be in the summer of 2011 when, along with Team USA, Rick won a gold medal in a combined F-Open/F-TR match against Ireland for the Creedmoor Cup. He felt that this was truly a special trip that will never be forgotten, in part due to the cup’s special ceremonies. Rick is honored to be representing the United States as the new Captain of the U.S. F-Class Open Team. 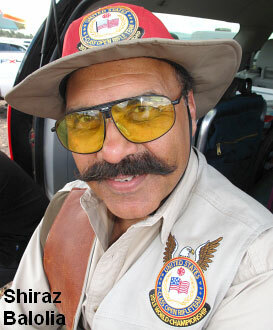 Shiraz tells us: “Yesterday marked my last day as Captain of The United States F-Class Open Rifle Team. I had indicated to the team several months back that I would not be able to continue serving as the Captain of the team due to time constraints. I am pleased to state that the NRA has picked a very good replacement for our team. Starting today, Rick Jensen is the new F-Class Open Rifle Team Captain for the United States. Rick has been a member of the U.S. F-Open Team for over six years and knows many of the various functions associated with it. He will make a fine Captain. Please join me in congratulating Rick as the new Captain of our United States F-Open Team. Congratulations, Rick! Share the post "Rick Jensen Named Captain of U.S. F-Class Open Team"
We ran this story in December, but we figure you guys needed a reminder, as we are now “well and truly” in 2014. Here’s the deal — “ORM D” is dead — you must NOT use “ORM D” labels on ammo shipments any more. Effective January 1, 2014, you must use the new DOT Diamond Labels instead. The Dept. of Transportation (DOT) has superseded the ORM-D ammo labels, replacing them with a larger striped diamond label that does not mention “Small Arms Cartridges”. This change is designed to harmonize U.S. shipping rules with United Nations standards. So, starting January 1, 2014, you MUST use the new “Limited Quantity” striped diamond labels for all ammo shipments. NOTE: These illustrations are not true to scale. The actual default Ltd Qty Diamond label to be used for ammo shipments is much larger, about 5″ per side. A smaller 2″ per side version of the Ltd Qty striped diamond can be used on smaller packages. Share the post "New Diamond Labels Required for Ammunition Shipments"
Texas is a haven for hunters and shooting enthusiasts, so we’re not surprised that the Lone Star State leads the nation in online ammo sales. However, you might be surprised that California, with its liberal, anti-gun politicians, is a close second. Yes, California was the second-most active source of online ammo purchases in 2013, according to statistics from LuckyGunner.com, one of the nation’s leading online ammo vendors. In fact, California was number one in 2012. For 2013, Texas edged California for the top spot, followed by Florida, Michigan, and (surprise) New York. More and more people are connecting to the internet via mobile devices. And, apparently, they are using those devices to shop for ammo. Luckygunner.com saw a significant increase in orders from mobile devices in 2013. Fully 22.7% of Luckygunner’s visits were made via mobile devices in 2013, compared to 18.8% in the preceding year. AccurateShooter.com has seen a similar rise in the number of visitors connecting to our site via mobile devices (particularly smartphones). 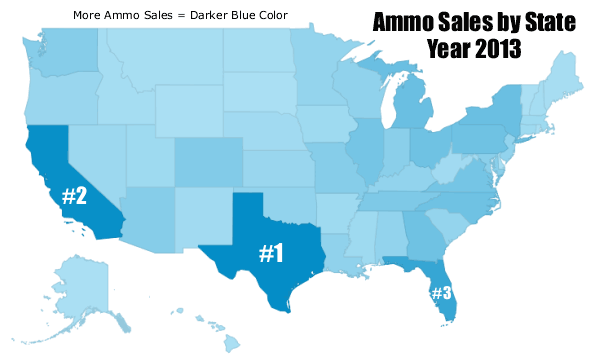 Share the post "Texas and California Lead Online Ammo Sales"